Another rainy day in Holland made it another great day for indoor activities. 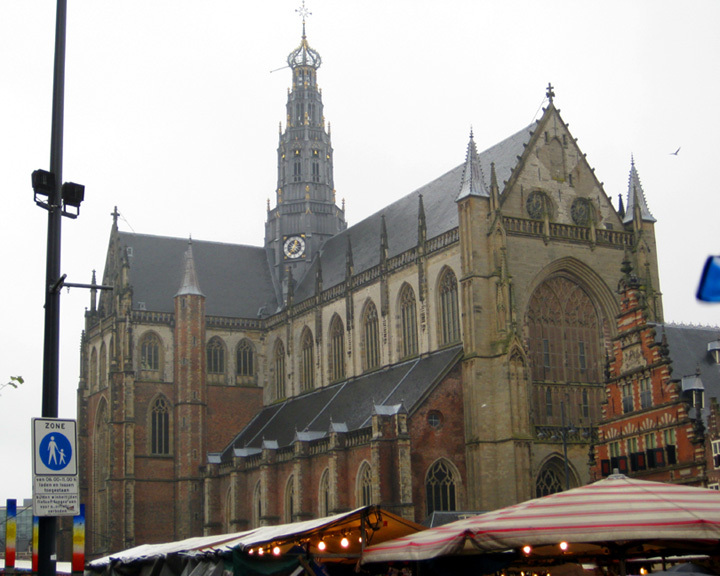 This Saturday, I would travel west to the town of Haarlem. Early in the morning of my recent trip to Amsterdam, I purchased a €7 round-trip (second class) that took 15 minutes on the "sneltrein" or "fast train" to the Haarlem central station, which is an easy 1/2 kilometer walk to the town square. 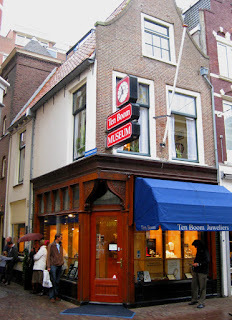 Between the train station and the square, I passed the home of Corrie ten Boom, which is above Ten Boom Juweliers located at Barteljorisstraat 19. Ten Boom was a young Christian woman who, during World War II, was part of the Dutch Resistance and would hide or help relocate Jews who were suffering or likely to suffer persecution at the hands of the Nazis. The house, which has been turned into a museum, is really quite remarkable. Unlike the Anne Frank house, which was stripped of its furniture at the request of Otto Frank, Anne's father, the Corrie ten Boom house is still adorned with furniture, giving a much better sense of how compact the quarters were -- and still are. At the ten Boom house, visitors are provided a tour guided by a docent, which can make it more interesting than a self-guided tour. Visits to the Anne Frank house are self-guided. Visitors to the ten Boom house can see and even step into the hiding place where the family would hide those being persecuted by the Nazis. That nook is also the title for a book about the family's heroic efforts: The Hiding Place, which ten Boom co-wrote with authors John and Elizabeth Sherrill. 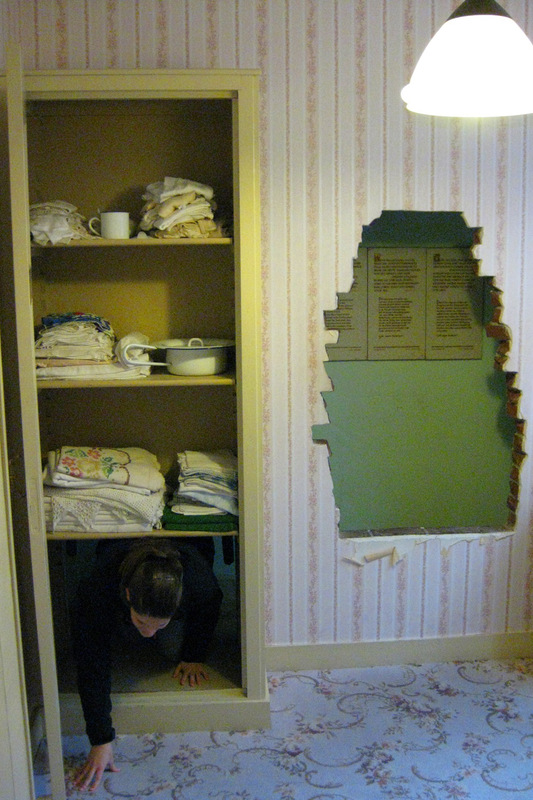 The photo at left shows a fellow visitor crawling through the access portal at the bottom of a linen closet, which was the access to the area behind a false wall. 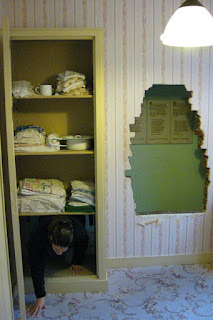 The hole in the wall to the right of the cabinet has been added for purposes of illustration. During the guided tour, the docent spoke frankly about the ten Boom family's faith, the issues they encountered, their losses, and the help they were able to provide to their neighbors who were in danger of or were already being persecuted. Although ten Boom and members of her family were eventually arrested and spent time in a concentration camp, it's less grim than the Anne Frank house in many ways, but no less interesting. While Anne Frank died as a teenager, essentially bringing her story to a close, Corrie ten Boom survived, wrote about her experiences and, until dying a natural death at the age of 91, traveled the world speaking of her experiences. After the tour, a walk to the town square was in order -- and proved quite enlightening when I realized the Gestapo had taken over the City Hall, which was only a few minutes' stroll from the ten Boom house. Others I've spoken to were right; Haarlem seems more authentically Dutch than Amsterdam, which is charming city, but a big city nonetheless.